With so many interesting types potatoes easily available these days, it’s fun to think about the possibilities of unusual presentations with potatoes as the base. We used Baby Yukon Gold potatoes and dressed them up for the occasion with a delicious combination of spicy Italian sausage, cheese and scallions. A more Mexican version might feature chorizo and a little lime crema for a topping. These hearty bites are always a crowd-pleaser. Make an extra batch, these usually disappear first whenever we serve them! 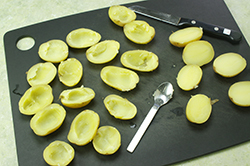 (1) Wash the potatoes and cut in half crosswise. Cook in salted boiling water for 10-15 minutes or until just tender. Drain well, and cool until easy to handle. (2) Meanwhile, brown the sausage. 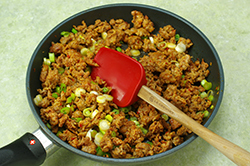 Thinly slice the scallions and add to the browning sausage in the last few minutes of cooking. Crush the garlic, and add to the sausage and scallions and continue cooking for a final minute. (3) Remove the sausage from heat, drain on paper towels, and allow to cool. 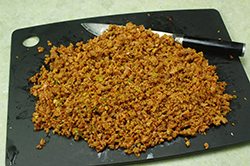 Chop mixture with a knife until a fine texture is reached. Set aside. (4) Scoop out the center of each potato half with a small spoon. 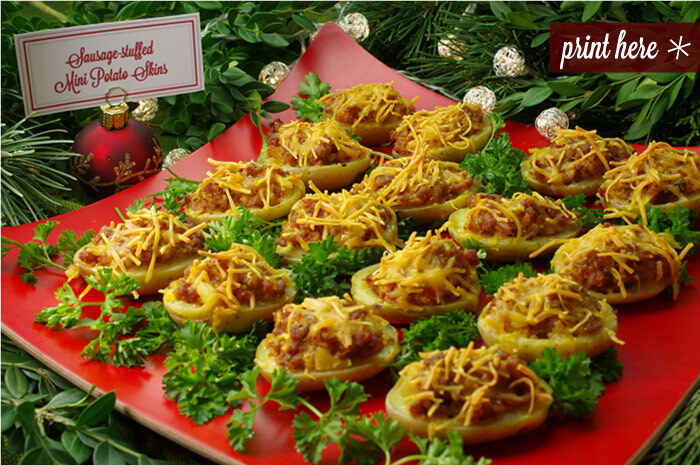 Place the potato skins on a rimmed baking sheet. Place the scooped insides in a bowl and coarsely mash with a fork or hand masher. Add the mashed insides to the sausage mixture and stir until evenly combined. Add half of the shredded cheese and mix to combine. Fill and mound each potato cavity with the sausage mixture pressing in slightly. Sprinkle the remaining 1/2 cup of shredded cheese on top. (5) Bake the filled potatoes in a 375°F for 20-22 minutes or until heated through, and the tops become golden. Remove from the oven and plate. (1) Boil the potatoes ahead of time, drain well. Store in an airtight bag until ready to fill and bake. 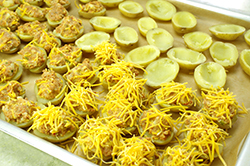 (2) Mix the filling ahead of time; store in the refrigerator until ready to fill and bake the appetizers.